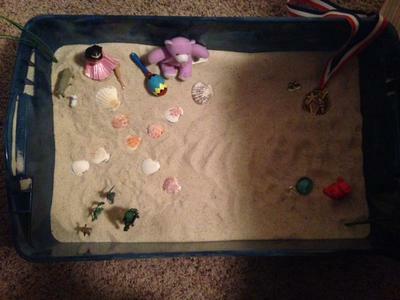 I really enjoyed this sand tray therapy activity although I felt somewhat limited in my selection for objects that fit my color personality. Since I have just started with the sand tray class, I am still working on building my collection. 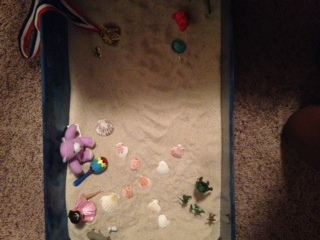 Regardless of my number of objects, this sand tray therapy activity still has a lot of value and meaning for me. My strongest personality color is blue. It was very easy for me to find objects that I could identify with for my blue. If you notice from my tray, the blue part of me is in the corner and elevated from the other corners of the tray. It also has the most objects in that specific corner. The girl sitting on top of the hill represents me. She is a ballerina, and blues are said to enjoy music. I felt this figure was a perfect match because I love to dance and have danced in the past on dance teams. The maraca also represents the music side of the blue, and the teddy bear represents the soft, warm, and kind side to my personality. If you notice right next to the girl, there are two lambs..one large and one small. This image represents another soft side to my persona, and how I am very motherly. The seashells represent a sense of calmness and serenity for me. Blues are not ones to like confrontation so placing each of the seashells almost helped to create a sense of calm in my tray. If you notice, the seashells also align around the corner of my blue section and I placed them in the shape of a cross to identify with the spiritual component of the blue. Green was my next strongest color, and I indicated this in the portion of my tray with the blue gem and crystal clear gemstones. I feel like it was hard for me to capture the intellectual part of myself with the figures I had so I chose to use items that instead captured the creative side of the green. Gold was very close in strength to my green color, and honestly the two can interchange very easily. I felt that it would be very appropriate to demonstrate my gold by positioning army men being led by a superior, such as a major or general. I know that at times, I can be firm and want to run the show, but also like any service men in the armed forces, I am dependable and can be counted on by anyone I am willing to help. My orange color was my weakest personality color, and I illustrated this color by placing the medal in a corner of the tray. I know that I am an extremely competitive person, no matter if it's a serious competition or not. I love to compete not only for the thrill, but to win.